The suite software giveaway from Steganos. 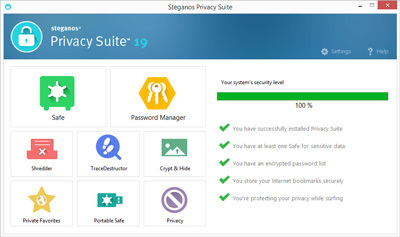 Steganos Privacy Suite 19 free license key free offer is now available again. The software is also called all-in-one tool because it contains many Steganos products in one suite. On the giveaway, get license key for Steganos Privacy Suite 19 for free. Normal price $69.95. The version given is not the latest because Steganos Privacy Suite 20 has been released. Steganos Privacy Suite is contains the products including Steganos Password Manager, Steganos Safe, and other tools. Available about 10 tools on the software. The tools offer total data protections when online. To protect your data, it using strong 256-bit AES encryption. Now the useful software is available for free. There two active giveaway Steganos Privacy Suite 19 license keys. A giveaway from Chips online and PCWelt in collaboration with the software vendor. To download one free license, use one of the link above. All link 100% work but offer is available for a short time. Visit one of the giveaway links above. Enter you valid email then click on “Seriennummer anfordern” button. The license key will be sent to your email inbox. Steganos Privacy Suite create a secure space on your hard disk to save your important data. It also can delete trace in the PC.